By making our homes into power generators we save money, protect ourselves from rising energy bills and increase our property value while reducing our carbon footprint for the present and next generation. Price Per Watt – The cost of solar panels can be expressed effectively by looking at the price per watt, or PPW. In 2017, the average cost in USD per watt was $2.80. This was down an incredible 61.3% since 2010. Most residential solar panel systems are anywhere between 5 and 10 kW in size and range from around $14,000-$28,000 or more. As of April 2018, GTM notes, an average gross cost of a solar energy system is down to $3.21 per watt in Texas — this cost is lower than the national average of $3.69 per watt, according to EnergySage’s Second Solar Marketplace Intel Report. Balance of system – The balance of system includes racking for the solar panels, roof integration equipment, wiring and conduit. Just add panels and an inverter and you’ve got a home solar system! Batteries – Batteries aren’t needed with a grid-tied system as the grid itself serves the purpose of providing electricity when your rooftop solar isn’t producing power. All those credits you accumulate when the sun is shining help pay down or completely negate the cost of electricity you utilize at night or on a cloudy day. Batteries are rapidly becoming more cost effective and will soon be the norm. FICO score – FICO is Fair, Isaac and Company, and it’s a method of calculating your credit score. There are three credit reporting agencies — Experian, TransUnion and Equifax. FICO is one method of calculating your score based on the information held by each credit agency. There are additional methods for calculating unofficial scores such as PLUS, Vantage and others, but they are usually only for informational purposes and do not count as official credit reports that can be used by banks, car dealerships or other financial institutions. Think of these different scoring systems like MILES (FICO) and KILOMETERS (all others). When a bank needs your credit score, they need miles, which would be FICO. For example, a solar leasing or financing company usually runs a FICO check from Experian, and all is needed is a 700 FICO credit score. Many times other scoring systems like PLUS and Vantage will not be accepted. 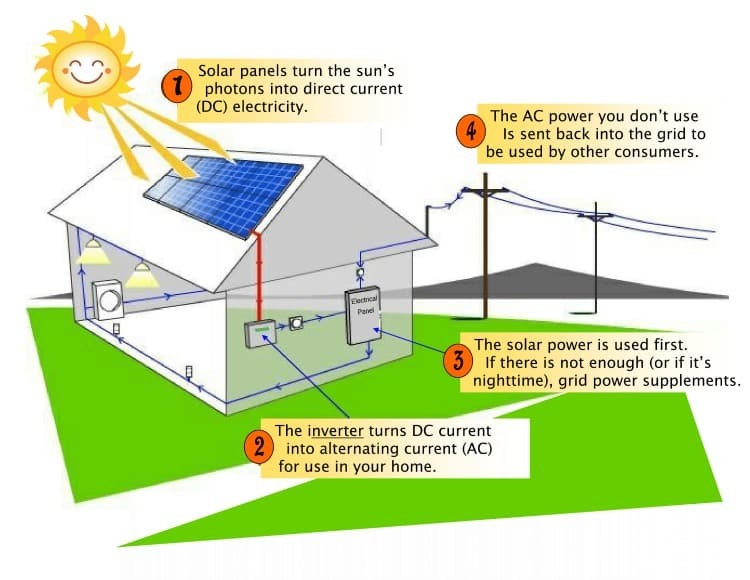 Interconnection – Interconnection is the point at which your solar system is connected to the electricity grid. The utility needs to give you permission to operate your power generator and “interconnect” it to their system. The solar installation company will usually complete all the necessary paperwork to get your system up and running. Kilowatt hour – A kilowatt-hour (kWh) is a unit of energy equal to 1000 watt-hours. If you left ten 100W light bulbs on for one hour, you would use 1 kWh of energy (though we know your house is better of with compact flourescent bulbs or better yet, LEDs!). Electric utilities bill customers in kWh. Module power ratings – To help standardize measurement of a solar panel’s power output, several government rating agencies created power rating standards. The most common ratings are STC-DC and CEC-AC. It’s a little confusing because both ratings are widely used, often together and each measures the solar panel output in a slightly different way. STC-DC (Standard Test Condition Direct Current) rating measures a panel’s output in ideal laboratory test conditions and is the standard global power rating for solar panels. 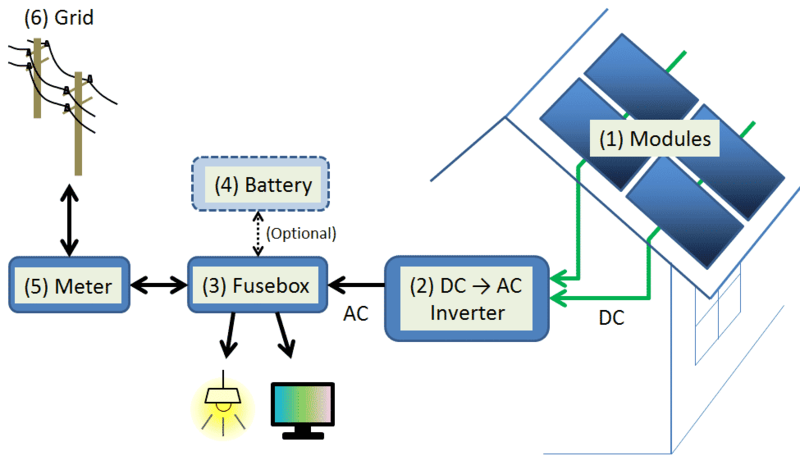 For example, CEC-AC (California Energy Commission Alternating Current) rating measures panel’s output in real life production conditions and factors in the inverter’s efficiency of converting DC to AC. The CEC-AC is always lower than the STC-DC rating, because it takes account of inefficiencies throughout the balance of the solar system. Net metering – When you install a grid-tied solar system, your utility monitors how much electricity your solar panels produce and how much electricity you use through a process known as net metering. If your home solar system generates more electricity than you use, you export it to the grid and receive credit from your utility. When you use more electricity than you generate, like at night, you draw it back off the grid as required. Your utility determines the difference between the electricity you generate and what you use from the grid, and bills you for that difference. Because the amount of power you’ll generate is greater during the summer than in the winter, this balance is reconciled at the end of each year or month to month depending on your utility company.If, at the end of the year, you have produced more than you used, some utilities will compensate you for this extra power but others will not. Contact your utility for up-to-date information about their net metering or solar bank program. PACE – PACE stands for Property Assessed Clean Energy. Many municipalities are setting up PACE programs that help their residents finance a solar system by paying it off through the annual property tax bill. The relatively high interest rate for most PACE programs typically makes PACE financing less cost-effective than some solar leases. It may, however, be a good option for people who do not live in a service area than can take advantage of solar lease programs. Please note that as of the summer of 2010, legal complications were interfering with the rollout of most PACE programs but those are being resolved. PPA – A PPA (Power Purchase Agreement) means you buy the energy that comes out of the system one kWh at a time and you have to buy all of it, so your payment changes each month. Think of this like renting a car PER MILE. Our lease is more like renting a car at a FLAT-RATE per day. You pay a fixed amount. And if the system produces more power than we thought, you get to keep it with no extra charge. A lease is better for the customer because your payment is more predictable. A PPA is better for the financing company because they don’t have to give away any power for free. Prepaid lease – You pay 20 years of leasing in advance at a discount. Much cheaper than a purchase, you still get the system for 20 years with a warranty covering everything “bumper to bumper”. Many consumer who are originally looking at a purchase find the prepaid lease to be a much better deal over a period of time that is basically hedging your energy costs, much like when Southwest Airlines® bought a bunch of jet fuel in advance and ended up saving themselves a ton of money. Solar inverter – The solar inverter is the electrical box that turns direct current (DC) electricity produced by solar panels into alternating current (AC) electricity. A grid-tied solar inverter allows this AC electricity to be sent back to the grid when you produce more energy than you use. Solar lease – A Solar Lease is a legal agreement between you and a solar leasing company that specifies the size of the system. The solar leasing company will install and maintain the system as part of the monthly amount you will pay the leasing company. A Solar Lease typically comes with a performance guarantee that promises the panels will produce the power agreed to in the contract and any power generated above and beyond the guaranteed amount is usually yours to keep. Solar panels – Also called solar modules, solar panels are made up of silicon “cells” that absorb photons (sunlight) to create a photovoltaic (PV) effect that allows for the conversion of sunlight to electricity. (Silicon just happens to be the Earth’s most abundant element other than oxygen and is also used to make computer chips, glass and cement.) Solar panels are linked together to form “strings” and strings are combined to form “arrays.” This array is connected to your home via an inverter, delivering electricity to power your home — or back to the grid, if your system produces more electricity than you use. The grid – The grid is a network of powerlines that carries and transmits electricity from large centralized power plants to individual homes. The term “going off the grid” refers to a household that generates all of its own power and no longer relies on the grid. Most metropolitan area systems are “grid-tied” (or connected to the grid) so you can still power your house when the sun doesn’t shine and can take advantage of all the tax incentives, as well as state and municipal rebates that are available for grid-tied systems. Utility – Depending on where you live, you get your power from a local municipality (e.g., CPS: City Public Service) or other large power producer. Utilities produce power and send it to you via the grid. Are you Considering Solar? This first video walks you through 8 major areas of questions to yourself and any potential solar contractor. And here is an additional list of top questions to ask a solar contractor. If you’re asking, “is solar worth it?”, this video shows what it’s like 5 years later with solar panels.